I simply love how this Halloween nail art turned out. It looks complicated at a glance, but is absolutely easy to do. And I am happy to say that this is the 5th design for my 2014 Halloween series. 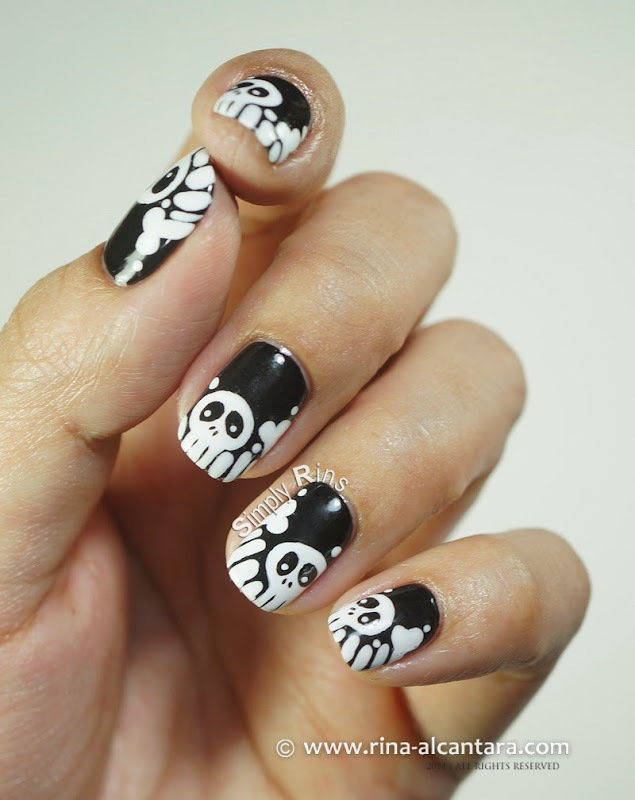 As the title suggests, this nail art was inspired by skulls and bones. I've done skulls for 2 straight years. Skull Skittles last year which was actually just a recreation of Colorful Skulls. But what I am about to share here is different and I hope you'll like it as much as I do. I feel a little weird though because I had mixed feelings with my previous bats nail art and all of sudden I feel thrilled about this! The idea was to paint a field of skulls on my nails but I figured that would be quite difficult to accomplish on such a small canvas. I also realized that it would entail so much detail for it to work. So I thought of just painting one skull on each nail and some bones. I used 2 coats of Deborah Lippmann Edge of Glory as black polish base. Other Halloween colors would probably work as well. As for the design, I used black and white acrylic paint, detail and striper nail art brushes. I decided to concentrate the design on the nail tips. I thought of randomly painting the skulls on different sides on each nail. But after I drew on one nail and liked it, I didn't bother to alter it when I continued painting the other nails. As mentioned earlier, this is fairly easy to do even with your non-dominant hand. Don't get discouraged if this seems complicated because I assure you, it is not. I have included a video nail art tutorial below to share with you how I painted this design. One of the things I learned from nail art painting is that sometimes, what makes a nail design easier to do is knowing what to paint first. 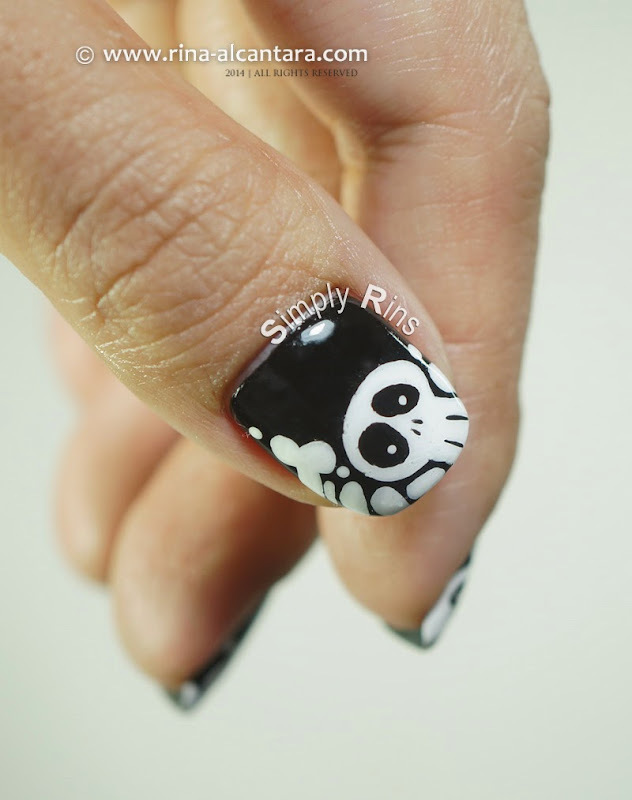 This is probably the spookiest among the Halloween nail art designs I have posted in this blog. We have 2 more weeks until the day of Trick or Treat is upon us. Hopefully, I could squeeze in a few more interesting nail art ideas for the scary season. Shoot me a message if you have any suggestions. The skulls have come put very neat... they look cool dear..
Love love love your tutorials! This is now what I have on my nails. I put China Glaze Ghoulish Glow over the top of everything (wish I'd only done the details) and it turned out great! Thank you! I wish I knew how to share a picture with you from my iPad... I'll try and figure it out.